Some days I feel like just a mess. A total and complete mess. Two weeks ago my kids all came down with a weird flu. Then my sister had complications in her pregnancy that sent her to have an emergency cesarean a month early. Then I came down with this flu. Now I am battling bronchitis. Then my new nephew was not keeping his temperature up and had to be sent to the nicu at the children's hospital. All this sickness, all the worry over my family, all the tiredness, I've just felt like an absolute mess. With being sick and dealing with sick kids, I've gotten completely off schedule. My routine is so far off balance it's laughable. I go to bed promising myself it will be better tomorrow, yet it never is. My daughter is graduating high school in 3 days and I have turned into a blubbering fool. Graduation preparations having me crying at the drop of a hat. I feel like a ridiculous mess. Yet right smack in the middle of my mess, God continually reminds me of His great love for me. It might be the way the sun in shining in the window, the way my children laugh, the way He healed my new tiny nephew, the way my husband took my laptop from my hands and covered me up because I was seriously nodding off while working, the way a verse of His goodness pops out while reading His Word or the way just the right song comes on the radio at just the right time. and those who see me diligently will find me. Whatever you've been facing lately, whatever your mess is, take time out to see the beauty in it. 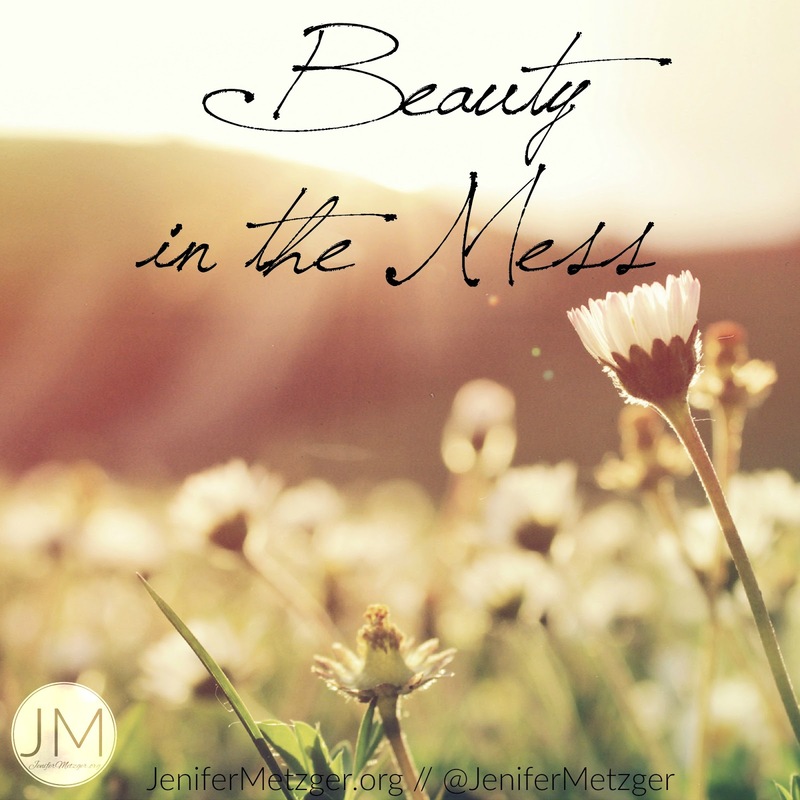 To see what God is teaching you in the middle of the mess. To find those reminders that He is still there with you. Praying for you Jennifer that God's perfect peace will surround you in these times. The beauty in all of our lives is that we are never ever alone. God is always right there with His arms stretched out wide to embrace us in our times of frustration, despair, craziness or whatever we may be feeling.